It’s one of the most universally-accepted principles in investing: your portfolio should combine higher-risk, higher-ceiling investment vehicles, and lower-risk vehicles offering more modest returns. As your portfolio matures and you get closer to retirement, your overall mix of investments should tend toward the latter to preserve wealth and mitigate risk. There is much more written about high return investments – whether it’s investing in a hot tech startup or riding the latest stock tip, our collective imagination seems to be captured by high-risk, high-return investments. By contrast, conservative fixed-income assets are generally viewed as a limited and boring set of options; the thing you know you should invest in but are never excited to. 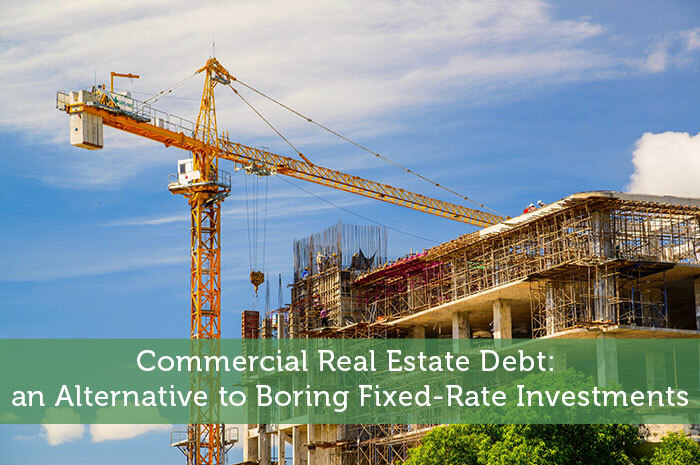 High yield commercial real estate debt offers a hybrid profile – fixed cash flow, yet with higher returns than most fixed income vehicles (particular now with interest rates near zero) and the inherent appeal of a tangible asset. From CDs to treasury bonds to unit investment trusts to utility stocks to fixed annuities, these options offer low risk and require very little knowledge or upkeep, but limited annual returns of between .5% and 5%. With the advent of direct real estate platforms, there’s a new option: commercial real estate debt. Like these other vehicles, investing in commercial real estate debt offers stable, fixed returns, but with a significantly higher range of returns – between 7% and 11% APR. High yield commercial real estate loans like this are typically short in duration (6-18 months) and offered by private lenders instead of banks. There are numerous reasons why a borrower will opt for a higher interest rate loan from a private lender rather than getting a loan from a large bank, including the comparative speed of funding, especially given the short term of these loans. While there are hundreds of these private lenders across the country, few investors have easy access to invest with them. Collateralization – These loans are secured by the property through a mortgage or deed of trust, meaning that the lender is able to take control of the property in the unlikely event that the borrower defaults. Foreclosure is far from an ideal outcome so we target lender’s with extremely low default rates in their portfolio. However, in the event that something unexpected happens the ability to take over and sell the property provides substantial downside protection for these investments. Conservative Leverage – Most lenders require the borrower (or “sponsor”) to contribute a certain percentage of their own capital to the project, much like a bank issuing a mortgage would require an individual to contribute a certain percentage of the home’s value as a down payment. Typically, the lenders we work with target a 75% LTV (loan-to-value ratio) or lower (more conservative). This serves two purposes: it ensures that the borrower has skin in the game so they’re incentivized to make timely payments and it provides a cushion for the lender (and thus investors) to recoup the full loan amount in the event that sale or foreclosure is necessary. Lender Experience – When you invest in these debt deals you are investing alongside the lender so their experience is important. In the case of any deal on our platform, the lender will have a proven track record and substantial industry experience, typically in the particular market and the asset class where they are lending. There has never been a harder time to find strong returns without substantial risk, so this option is emerging at the right time. The next time you find yourself with an extra $5k in your savings account, consider putting it toward commercial real estate debt.